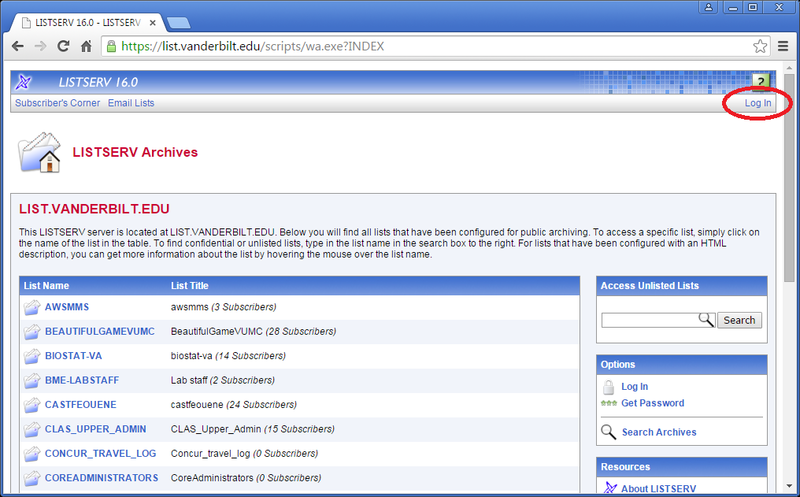 To send an email to a list, open up a new message window in your mail client, and type the name of your list in the “To:” field: <listname>@list.vanderbilt.edu, e.g., vanderbilt-students@list.vanderbilt.edu. Your list may be configured to require a confirmation. If you get a confirmation email, be sure to click on the link provided to confirm that you sent the message. Your list may also require approval from a moderator. If your message does not appear immediately in your mailbox, do not resend. Wait for the moderator to release the message from the moderation queue on the List Management Dashboard page. 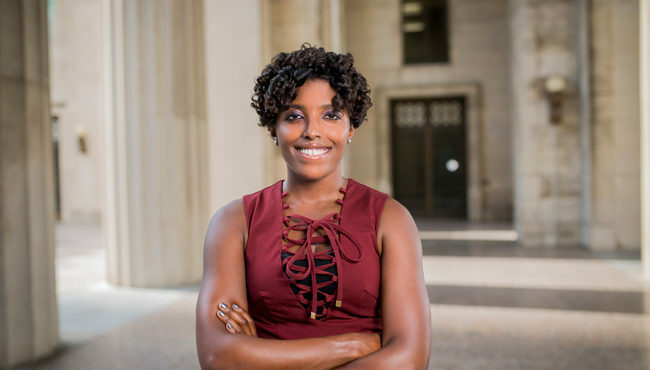 If you are a list administrator, charged with configuring or maintaining the list, or with reviewing messages before releasing them, the tutorial below may be of some use to you. 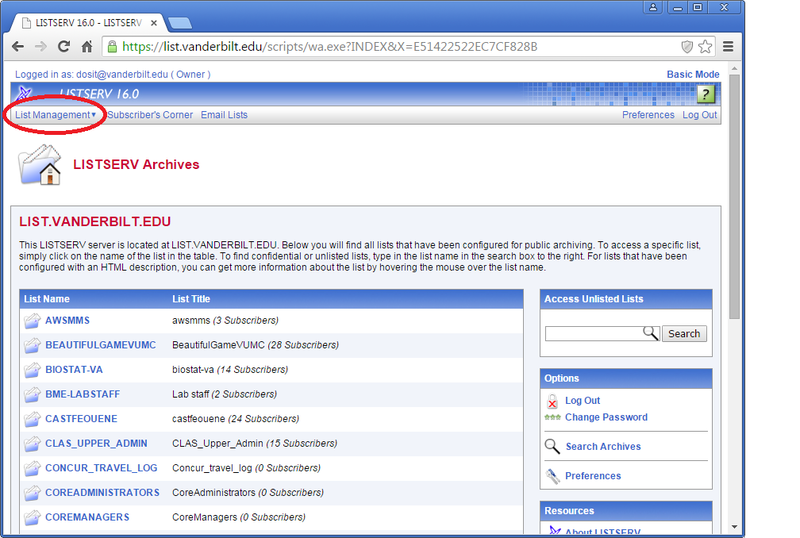 Note that most list administrators for student organizations will not need to configure their lists. The Dean of Students IT Support unit applies a standard set of configurations when it sets up lists. 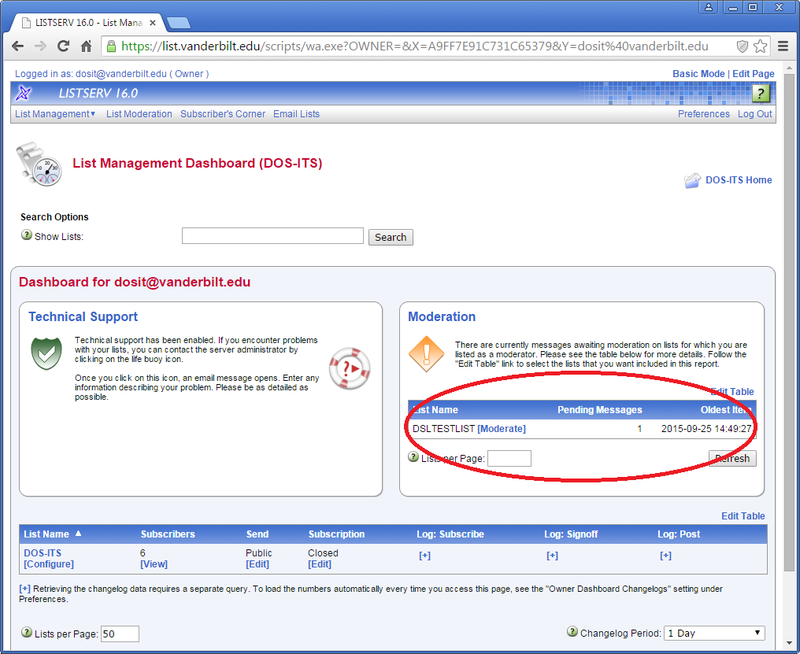 If you think you need to change an element of configuration, please consult deanofstudentsit@vanderbilt.edu before doing so. 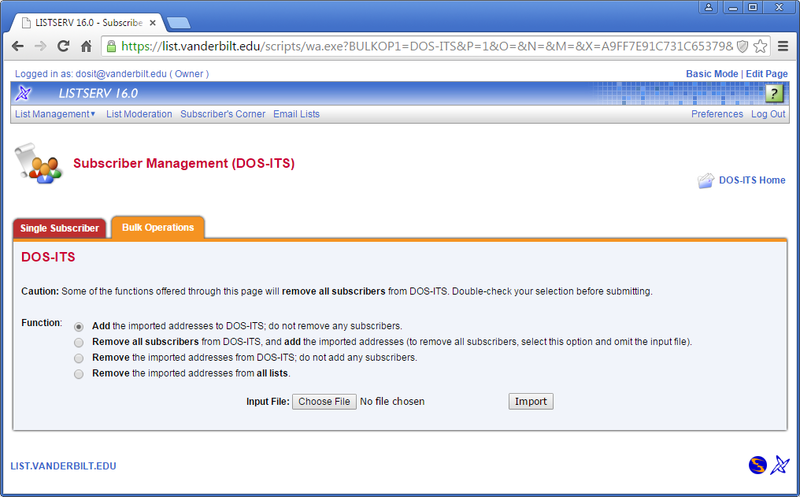 To start, go to https://list.vanderbilt.edu/ and Log In by clicking the link in the upper right corner. Note that you will need to log in using your email address (not VUnetID) and ePassword. If you have more than one email address, it will be your preferred email address. At this point, select “List Dashboard” from the “List Management” menu in the upper right of the screen. Messages requiring moderation will be in a box on the right side of the dashboard. 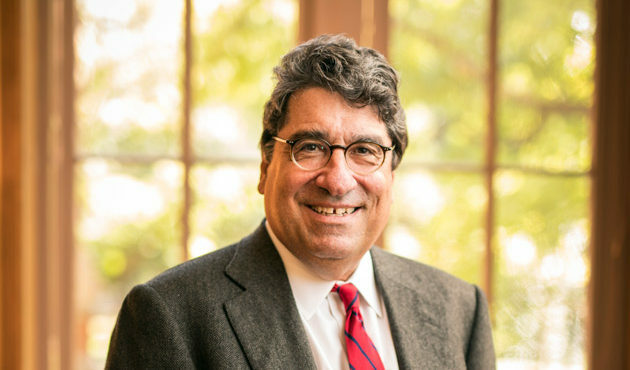 The lists to which you have access are listed at the bottom of the page. If you wish to change the configuration (not likely), click the [Configure] link below the list name. If you wish to add or delete subscribers to a list, select “Subscriber Management” from the “List Management” pull down menu. If you have subscriber management privileges for more than one list, select the list you wish to manage from the “Select List” pull down menu just under the navigation band. 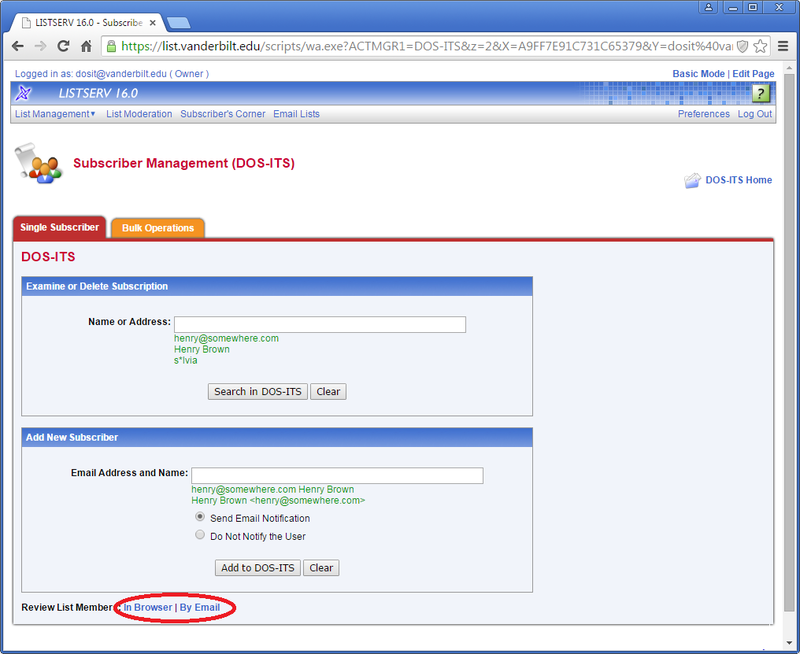 From this point, the labels on the page should guide you for “Single Subscriber” management. At the bottom of the page, you have an option to review a list of current subscribers in a separate browser window or request a list sent as an email to your inbox. If you wish to delete everyone from a list, or add a number of folks all at once, click on the “Bulk Operations” tab. If you build the list in a spreadsheet or a word processor, the safest thing to do is to copy the data and paste it into a new document in a text editor, then save the file as plain text. Once you have saved your plain text file, follow the instructions on the Bulk Operations tab to upload the subscribers in the file. A message will appear under the Subscriber Management (Listname) banner letting you know the results of your file import. 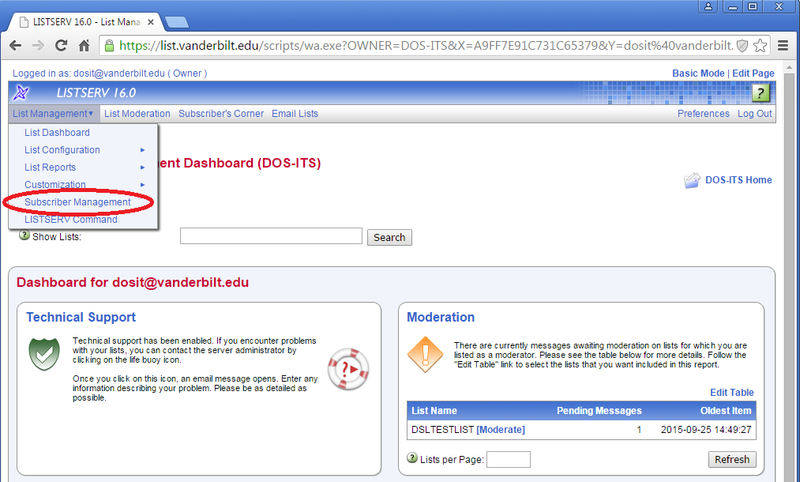 There are many help screens in the Listserv management tool to assist you if you have questions.